Web pages often use images for navigation. They’re prettier than plain-text links, and you can add both form and function on your page with one element. When you use an <img> element with an anchor element to create a linking image, you can attach only one link to that image. To create a larger image that connects links to different regions on the page, you need an image map. For example, an image of a park might show a playground, a picnic area, and a pond area. Use the <img> element to add the map image into your page, just as you would any other image. 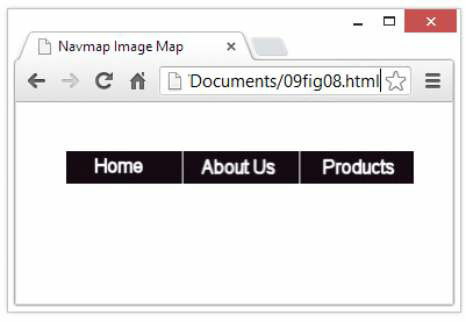 In addition, include the usemap attribute to let the browser know that image map information should go with that image. The value of the usemap attribute is the name of your map. map holds the map information. The map element uses the name attribute to identify the map. The value of name should match the value of usemap in the <img> element that goes with the map. shape: Specifies the shape of the region (a clickable hot spot that makes the image map work). You can choose from rect (rectangle), circle, and poly (a triangle or polygon). coords: Defines the region’s coordinates. A rectangle’s coordinates include the left, right, top, and bottom points. A circle’s coordinates include the x and y coordinates for the center of the circle as well as the circle’s radius. A polygon’s coordinates are a collection of x and y coordinates for every vertex in the polygon. To determine image coordinates, you can use an image map editor such as Mapedit or a graphics editor such as PaintShop Photo Pro. Mapedit also records those coordinates for you. href: Specifies the URL to which the region links (can be absolute or relative). alt: Provides alternative text for the image region. <img src="09fg08-navmap.gif" width="302" height="30" usemap="#NavMap"
<area shape="rect" coords="0,0,99,30" href="home.html" alt="Home"
<area shape="rect" coords="102,0,202,30" href="about.html" alt="About"
The figure shows how a browser displays this markup. When the mouse sits over a region in the map, the cursor turns into a pointing hand (just as it changes over any other hyperlink). So take advantage of the title text to include useful information about the link and to make the map more accessible to the visually impaired. The About.com image map tutorial provides more details on building image maps by hand. HTMLGoodies has a great collection of image map tutorials and information. Creating image maps by hand can be tricky. Use an image editor to identify each point in your map and then create the proper markup for it. Most HTML tools include utilities to help you make image maps. If you take advantage of such a tool, you can create image maps quickly and with few errors. Always use HTML and CSS for the main website navigation, or if you must use a graphical image map, include a text-based alternative along with that map so that visually impaired site visitors can also navigate by using the alternative controls instead. In general, the best thing for navigation is to use text for button labels and to let CSS handle the work involved in making buttons look good.